We’ve heard time and time again that organizations with engaged employees are more successful. But Marriott International’s Executive Vice President and Global Chief HR Officer David Rodriguez has the data to back it up. For these reasons and more, taking care of associates and encouraging employee engagement has been the company’s top priority since it was founded in 1927. 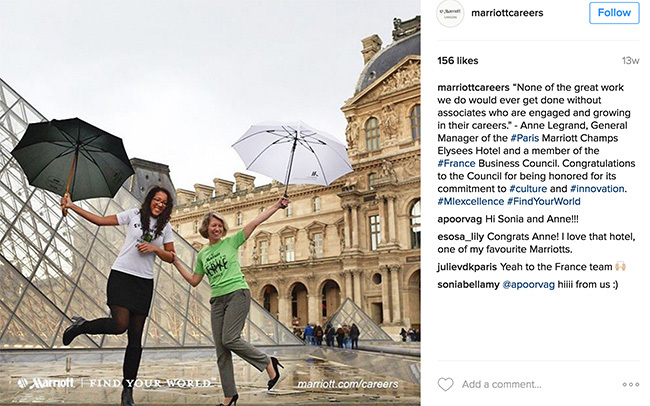 Here are the steps Marriott has taken to successfully foster employee engagement throughout its growing global organization. 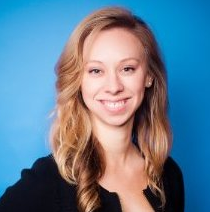 “Our employer value proposition is simple—wellbeing and happiness. Everyone wants to feel proud of where they work and feel good about themselves,” Rodriguez shares. TakeCare is not just about programs and initiatives; it’s an effort to build a company culture that supports every employee from a front desk attendant at a hotel to the CEO at Marriott headquarters in the pursuit of wellbeing and happiness. The meaning of ‘wellbeing’ spans physical, emotional and financial ideals, as well as how associates feel among their teammates and the role they play in the community. The ‘Movement’ may be advocated by the CEO, but it truly comes to life via grassroots efforts designed by Marriott associates around the world. Employees are empowered to decide what wellbeing means to them, often within the context of their cultures and communities, and organize efforts to make an impact. For example, employees in the Bangkok office decided to raise money to buy helmets for children who ride often treacherous and over-crowded mopeds around busy urban streets. The employees went even further—they invited the children into the office to paint their new helmets. Other employee-led initiatives include advocating for healthier options in their hotel cafes and organizing 5k races. The sky’s the limit. 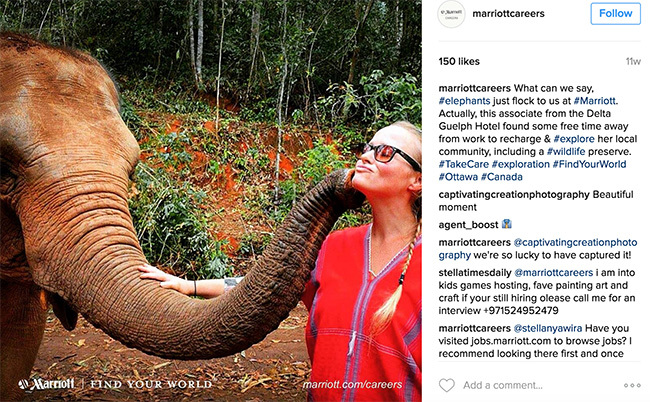 TakeCare’s impact doesn’t just rely on a set of ongoing initiatives unique to each Marriott property. Each year in May, Marriott associates around the world unite for a global day of volunteerism that has been coined Spirit To Serve. This year, an estimated 35,000 associates performed 90,000 volunteer hours in just one global day—that’s more than 10 years of collective service. David explains that successful company cultures are supported by the company brand and marketing organization. Once a company has defined its organizational values, great leaders empower employees to interpret what the EVP means to them. That’s how a culture becomes a relevant and authentic company movement. David’s heart is so much in this TakeCare Movement that he wrote an open and honest post on LinkedIn about how wellbeing saved his life. Talk about authentic leadership. In 2016, David’s team asked employees to share their unique moments of happiness and inspiration with his team. Far exceeding expectations, his team received more than 27,000 images from 600+ properties around the globe. The goal of the campaign was simple: show associates living the company’s value of wellbeing. 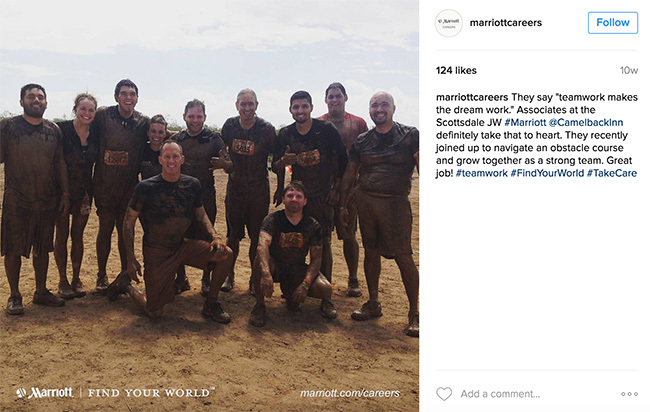 The level of participation and enthusiasm reflects how well Marriott associates embrace TakeCare and truly live the culture. Think about what your organization stands for. How can you inspire your employees to bring that value to life?